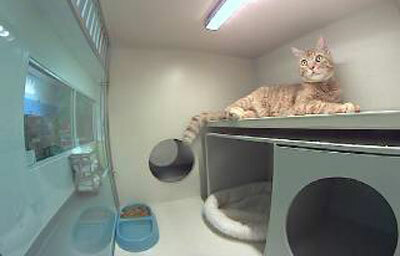 AVMI Upgrades to Cat Cottages™ and adds iCat Web Cams for their hyperthyroid cat patients. In their continued effort to provide the best for their patient’s, Advanced Veterinary Medical Imaging has installed all new Snyder Cat Cottages™ in their feline hyperthyroid cat therapy room. These Cottages use Synder’s exclusive Litter Pan Hider™ and Cottage Fresh Vent System™. “Because we know that cats like their privacy, each cottage comes equipped with a Cat Nap-purr personal hideaway” says owner of AVMI, Dr. Michael Broome. “The separate bathroom area attached to each cat Cottage that is independently ventilated improves the air quality for both the patient and their care givers” says Broome. In addition to the new custom designed cat cottages, AVMI has also added personal web cams that they cleverly call the iCat. These web cams allow clients to log on and view their cat at any time during their hospitalization for radioiodine therapy. According to Dr. Broome, “Each of our new Cat Cottages has its own private iCat web camera to allow password protected web based viewing of their cats by our clients”. The use of a private web cam for each patient ensures that multiple clients will not be signed on simultaneously and end up fighting for remote control of a single camera used to view multiple patients from across the room. Another benefit of these individual cameras is the added privacy afforded to clients who may not want others to have unlimited access to their cat’s hospitalization details.